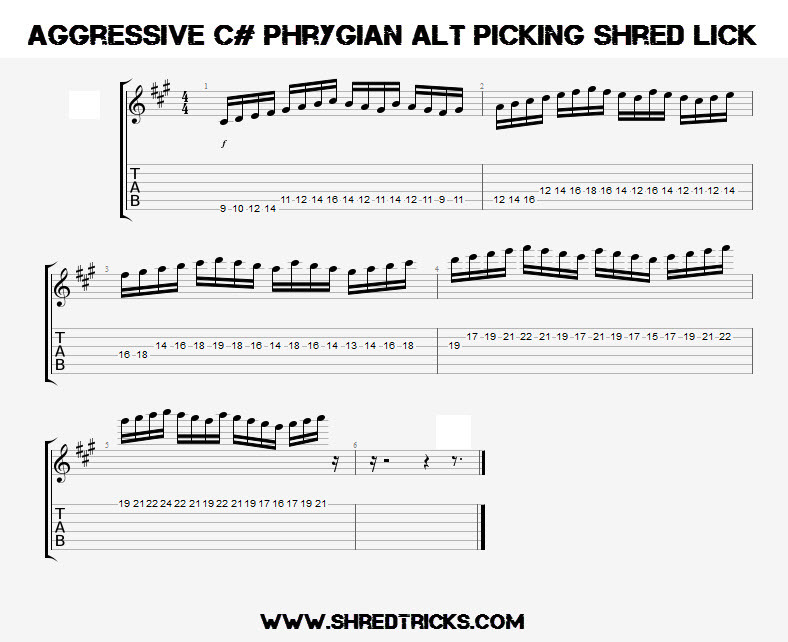 Aggressive C# Phrygian Alt Picking Lick - . :Shred Tricks - Shred Guitar Lessons by Eric Maldonado:. Here is an aggressive C# Phrygian alternate picking lick I learned from Rusty Cooley years ago. The trick to practicing this lick is to practice the individual positions by themselves, slow, at first. Get used to one position and master it, then move on to the next, and the next, and the next etc. Master each positions slow and fast, and then, move on to the next one and do the same. This lick is great for practicing picking but it could also be a sick legato lick. So try out all different techniques with this one!